Picturesque Southern Germany includes much of the most famous landscapes of Germany. The Black Forest, the Alps, the Danube, and even the Rhine River for some part all find themselves in Southern Germany. 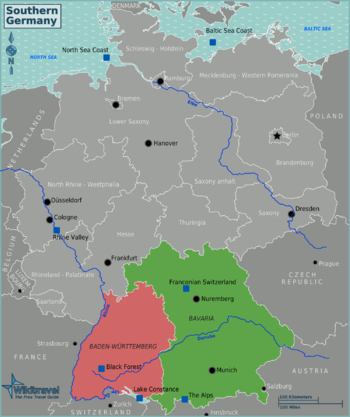 The German regional cultures of the Alemanni, Bavarians, Franks and Swabians dominate this region. Southern Germany is predominantly Catholic and oriented towards southern Europe by speaking similar dialects as found in neighbouring Switzerland and Austria. It is Germany's tourism hotspot due to many of its attractions. This page was last edited on 23 May 2018, at 07:37.